Tonight, Friday, it’s all about Uptown. Break for house managing; i’ll be facilitating box office goodyness over at Cult Status Gallery for the BYOV show The 612 by Rogues Gallery Arts. Sounds really interesting. Come buy a ticket from me; see 4 short plays plus a gallery show of visual art! Friday will probably finish up with some drinkinating & socializing at Moto-i (this year’s Fringe Central location). 5:30 maybe Our Freaking Kids Show by Mainly Me Productions at U of M Rarig Thrust, or maybe taking a break, getting some food and lying in the grass somewhere. 7:00 Callahan and Lingo presents: The Last Ditch by ACM Productions at U of M Rarig Arena or possibly another attempt at getting over to Mill City for Fletcher & Zenobia & will try plan to see Allegra* & Rob’s show later in the week. Phew! I did it! I mean, I planned it. Now all that’s left is to go enjoy. Sunday I won’t be seeing shows because I will be working as a house manager at the Playwright’s Center all day long. Food donations gladly accepted. Hint hint nudge nudge. 15 Shows at Minnesota Fringe that will make your brain sparkle. My favorite piece of paper ever. August has arrived. The fringeyness has begun to take over the world of Robyn. Here’s 15 shows I’m looking forward to seeing this year; you can click on all the titles to go to each show’s page on the minnesota fringe website (create an account and add them to your schedule, then come back and read the rest of the list!). Live Action Set. Directed by Sara Richardson. Starring Noah Bremer, Hans Hauge, Kimberly Richardson, Dario Tangelson, and Emily Zimmer. A BYOV (Bring-your-own-venue) in the Mill City Museum’s train shed. The potential for this not to be good is completely inconceivable to me. I’m not sure what the venue capacity is and would suggest getting their early, they have often sold out in the past. Worth the wait in line. “Stand Up” unabashedly unravels female stereotypes and the objectification of women. Just as “Thinkingaview” provided an avenue to unravel social constructs through the creative use of repetition, “Stand Up” does the same, this time flipping the feminist movement on its head, dissecting our cultural tendencies regarding politics, beauty, power, marriage, child rearing and reproductive rights. Music and tap dancing. They always get rave reviews and I’ve never made it to a show. Hoping to change that this year. You might remember me raving about this show last year. It’s back! And I think I will go see it again. It was that good. An adorable old librarian finds a book that has been returned when it is 123 years overdue, and becomes obsessed with solving the mystery. It also received the best reviews of any show at last year’s fringe and sold out it’s last show despite being a last minute addition with no pre-festival marketing. Must-see!!! Four Humors Theater never disappoints, and they are doing James Bond with puppets. Need I say more? Three more words: Sock puppet henchmen. Courtney McLean and Mike Fotis are in it, so it’s got to be good. Another returning hit from last year, by Amy Salloway. Abso-frickin’-hilarious. She likes to rewrite things over and over so it’ll probably be a little different from last year; I know she’s got a different guy playing “Dean” – the unitarian universalist obsessed with buffy the vampire slayer who has given 90% of his heart to another woman who is in a “lesbian phase.” Anyway, I’m sure it’ll be very funny. I hope she still does the squeaky sound effects…go see it to find out what I mean. By Third Rabbit Dance. Joyful solo show by John Munger. Every time I see him dance, my preconception of the limits of expression the human body can accomplish flies out the window. Rob Callahan + Allegra Lingo. Two storyteller performers create a show at the last minute when they get picked off the waiting list just a few weeks before the festival. Check out their show page for a preview. Should be, in a phrase Allegra uses all the time, awesomesauce. Or Amazeballs. Or both! By Joking Envelope, written by Joseph Scrimshaw. Scrimshaw epitomizes Fringe in many ways. If you haven’t been to a Joking Envelope show yet, you should go so you at least know what all the buzz is all about. Generally everything they do is very, very funny. Created by and starring Christopher Kehoe. I’ve seen his last two one-man shows at the last two Fringes and he is simply a phenomenal actor. Darkly funny, which is my favorite type of funny. And hey, they are giving away nine $20 gift cards to the Republic on opening night! I’ve actually only seen Tom Reed at improv at Brave New Workshop/Huge Theater and as a host of this year’s 10 Second Film Festival. When he did Parry Hotter and the Half Drunk Twins he was in a crazy tiny venue that was ridiculously sold out the entire festival, and I wasn’t quite as intrigued by last year’s Bite me Twilight since I haven’t read the books or seen the movies. But he’s hilarious! And he’s doing a parody of ALL of the Disney princess movies. So this is definitely a must-see. Another get-there-early one. I went to college with this dude, Ben Egerman, and now he makes post-apocalyptic comedy shows, this one involving a wolf puppet with a monocle and funny charts drawn on cardboard. Previously created “Please Don’t Kill Me Killler Robots.” Which also involved funny things drawn on cardboard. Me likey. Ben San Del creates clever stuff and brings together a great looking cast. And I adore their promo images. *To see shows you’ll need the $4 festival admission button, and regular tickets are $12 per show. 5-show and 10-show punchcards are available which give you a discount of $2 off per ticket; great way to see a bunch of shows yourself or bring a group! 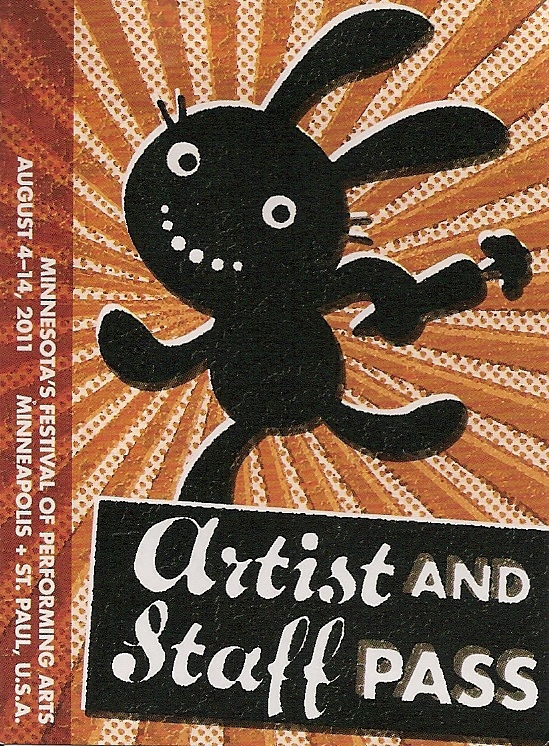 Psst: The views expressed here are my own and are not perpetuated from nor endorsed by the Minnesota Fringe Festival.